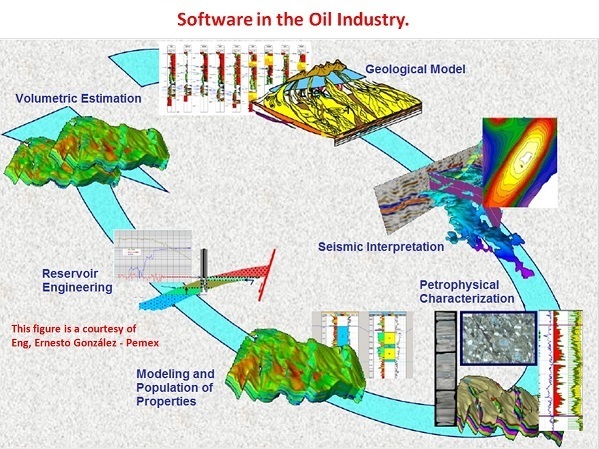 As can be seen in the image above the oil industry is increasing day by day its dependence on specialized software at all stages. This is a historical necessity that has evolved from the need to enhance the capabilities of exploration and production, as well as the needs of prediction and projection of the performance of an oil field. Our company has acquired experience in software development for all stages of the industry. But a peculiar feature of our company is that we do not sell software. What we sell is the development of software for your own use in your business. A clear example is the following . If you have to pay 20.000 USD per year for a license of a commercial software and we can develop this software for 60.000 USD, you will pay the investment in three years and the remaining life of the software will be free. In addition, you participate in the development of your own software, providing your own experience and customizing it to the needs of your business. But an additional advantage is that you are the owner of your software. You can therefore sell it if you want, thus creating a new business for your company. For all these reasons, we can provide greater benefits to your company than other companies that sell software for the oil industry.